This page is being written in response to two declarations signed by up to 50 Orthodox rabbis. The first declared that the New Testament is a Jewish document! This is amazing as it shows that the rabbis have read the New Testament, the Brit Ha Chadeshah of Jeremiah 31:31-34, and examined it and found that it is not a complete break with the Old Testament (also called the Tanach, T for Torah, N for prophets in Hebrew and the gutteral ch for writings in Hebrew which is more like k but here it appears at the end of the word Tanach thus the different sound for the same letter). Online readers may know one name but not the other so both are mentioned. I would not be surprised if these rabbis know more than many Christians that the New Testament quotes the Tanach often. This is due to lack of reading the Old Testament from cover to cover to recognize the passages that are quoted in the New Testament as having the Old Testament as their source. The second declared that G-d has a valid covenant with the Gentiles (December 5, 2015). I rejoiced too soon along with many others as we interpreted the declaration as a recognition of Jesus Christ for the Jews. The response to the contrary seemed to indicate Gentiles have their Covenant, we Jews have our Covenant. Two nations, two covenants. Apparently, Jews are still seen to live according to the covenant of the law without Jesus Christ while the Gentiles live under the covenant of grace with Jesus Christ. I would like to challenge righteousness before G-d as achieved by obedience to the law only. I would like to challenge that there are two covenants serving two peoples at the same time. Righteousness is by faith alone in G-d. There is only one covenant and that is found in Jeremiah 31:27-40. The law is from G-d. Jesus Christ fulfilled it for Jews placing their faith in him and for Gentiles also. One covenant, one people. Since this is not a book with many pages, I can only point the way. If you are motivated to investigate, continue reading and then click on the links above. There are strong points made below also. The 6 pages listed below reference scriptures mentioned on each page. The pages were written over the years and updated to reflect current use without major change. The Hebrew page references Isaiah 53, Acts 8:26-39 about Isaiah 53, The Jesus Film is the Gospel of Luke, Genesis 15:6, Psam 27:10, Jeremiah 29:10-14, Jeremiah 31:31-34, Isaiah 9:6-7, Daniel 9:24-27, Zephaniah 3:14-17, Colossians 1:26, Daniel 7:13-14. The Hebrew Mystery page references Colossians 1:26, Habakkuk 2:3, Genesis 3:15, Romans 9, 10, 11, Ezekiel 46, 47, Isaiah 28:11, Zechariah 2:8, Romans 8:26, Luke 15:26, (Why the mystery hid from the ages? : Genesis 3:15, Deuteronomy 21:23, Galatians 3:13, Isaiah 53), Genesis 49:9-12, Isaiah 11:1-10, Micah 5:2, Matthew 1-2:1, Revelation 5:9-13, Zechariah 12, Zechariah 12:10, Daniel 11:36, Matthew 24:15, Genesis 1:26, Deuteronomy 6:4, Isaiah 64:8, Psalm 110:1, Isaiah 9:6, Genesis 1:2, Isaiah 66:8, Daniel 7:13-14, Isaiah 42:6. The Hebrew Gentile Mystery page references Isaiah 42:6, Genesis 6:6, Genesis 9:13-17, Genesis 15:6, Genesis 14:18-20, Genesis 22:17, Genesis 25:23, Genesis 25:31, Genesis 27:37, Deuteronmy 28, Isaiah 42:1, Amos 8:1, Isaiah 9:6, Isaiah 64:6, Isaiah 49:6, Isaiah 53, I Samuel 23:2, I Kings 6:8-23, Philippians 3:5, Romans 1:16, Romans 9:1-5, I Corinthians 1:1,Isaiah 49:5-6, Matthew 8:5-12, John 4:1-42, Acts 10, Acts 15, Acts 15:24-30, Romans 1:16, Galatians, John 9, Jeremiah 31:31-34, Daniel, Revelation, Deuteronomy 21:23, Galatians 3:13, Daniel 7:13-14. The Gentile Mystery page references Isaiah 49:6-7, Jonah, Ruth, Hebrews 6:16-28, Zechariah 12, Zechariah 12:11-14, Revelation 14, Zechariah 12, Daniel 9:27, Hebrews 3:15, Luke 14:12-24, Luke 14:23, Hebrews 3:15, Matthew 21:28-31, Romans 6:23, Deuteronomy 21:23, Galatians 3:13, Daniel 7:13-14. The Genesis page references too many scriptures to list. The page is named "Jesus is Coming" because if you follow Genesis through, you can see the promises of G-d to Adam, Noah, Abraham, Isaac, and Jacob which continue with greater light after Genesis to Moses, David and the prophets who all lead to Jesus Christ. "Jesus is coming" is the punchline or the bottom line. No one else is coming! The sacrifice of an animal for Adam and Eve's covering of their shame points to the sacrifice of Jesus Christ. (Genesis 3:15) It's Eve's offspring against the serpent's offspring, not the blood of bulls and rams against the serpent. Blood of bulls and rams foreshadow and keep order but are not up to the task of redemption. Forgiveness of sin legally for eternity is above their pay grade. I am well aware that many scriptures that Gentiles understand to be about a physical manifestation of G-d you cannot view this way because your most famous rabbi said "G-d can never come in the flesh." (sic) The problem with that is, the Tanach doesn't support it and, in fact, says the opposite. You have made A SERIOUS ERROR over time starting about 400 BCE at the close of the Old Testament (Tanach), to allow TRADITION to be held in the same regard as G-d's Word. At the time of the destruction of Jerusalem (70 CE) (70 AD) due to the intention to keep Jews in the Diaspora faithful, A SECOND SERIOUS ERROR was made and enforced over the centuries, THE WORD OF THE RABBI is equal to scripture or the Word of G-d. So you added binding commentary to the Word of G-d, things G-d never said, things he never meant by what he said. Of course, other rabbis had to agree to the merit of the commentary but that still DETHONES THE WORD OF G-D TO BELOW THE COMMENTARY OF MAN. I am not sure who said "you cannot know G-d" but Jeremiah 31:31-34 says exactly the opposite. Jeremiah even says all shall know G-d, from the least to the greatest. Perhaps this means the rabbis will be the last to know HaShem. By the way, in this scripture, which covenant has been broken and which same covenant is G-d doing away with and which covenant is he replacing it with? Brit Ha Chadeshah is clearly replacing the Sinai covenant. The Our High Priest page references Exodus 30:10, Leviticus 17:11, Acts 23:1-5, Hebrews 4:14-16, Hebrews 14:12-15, Romans 6:4, I Samuel 30:8, Proverbs 3:5-6. Gentiles are in awe of you that you kept the Hebrew scriptures safe over the many centuries. We thank you! Thank you Thank you Thank you! However, we read them as they are. You have read them as commented on over the centuries by rabbis, being so intent that the scriptures cannot possibly speak of Jesus Christ, that YOU HAVE INTERPRETED THE SCRIPTURES TO AVOID JESUS CHRIST AND COME UP WITH THE OPPOSITE OF SCRIPTURE. Check out what Maimonidies is purported to have advised!!!!!!!!!!!!!!!!! "1a. 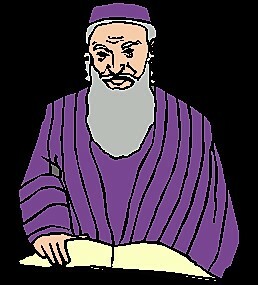 Maimonides (Rabbi Moses Ben Maimon): "Daniel has elucidated to us the knowledge of the end times. However, since they are secret, the wise [rabbis] have barred the calculation of the days of Messiah’s coming so that the untutored populace will not be led astray when they see that the End Times have already come but there is no sign of the Messiah" (Igeret Teiman, Chapter 3 p.24.)" (scroll down about 3/4ths of the length of the page to see the quote directly above). The next problem is assigned to THE MANY JEWS WHO ARE NOT RABBIS. They should be studying the scriptures themselves but THEY DECIDE THAT KNOWING THE SCRIPTURES IS THE RABBI'S JOB and the rabbis will tell them whatever they need to know. Ezekiel said, "The soul that sinneth, it shall die." (Ezekiel 18:20) G-d doesn't assign responsibility to anyone else for his or her own soul. The rabbis are not telling you what you need to know. Maybe the Christians are but they don't appear to be a reliable source because...they are philosophical idiots because no one can know G-d and G-d can never come in the flesh. (sic) You have no idea these statements are not in the Tanach! Then there is the matter of how to be in right standing with G-d. I just hope I can do justice to righteousness by faith. Abram (later renamed Abraham, father of many) was not a Jew. He was a man living in a multi-theistic culture with lots of gods. G-d called him out of the familiar to go to a place G-d would show him. (Genesis 12:1-9) Abraham took Lot with him, not part of the deal, but Abram did leave. Please note that G-d promised to bless those who bless Abram and curse those who don't. This is a friendly warning with possibly not so friendly results still in force in the 21st century. Just click above to read it. G-d also promised Abram the land of Canaan. Abram is not alone in serving the most high G-d. He tithes to the king of righteousness, Melchizedek, (Genesis 14:17-24) who blesses Abram by G-d Most High, maker of heaven and earth. Abram has an interaction with manifest rigtheousness! Abram is in right standing with G-d.
G-d promised Abram that his descendants would be as the stars in the sky (Genesis 15:1-6) and also of his seed, not his servant's seed. What we ignore is that G-d counted Abram's faith in the promises of G-d as righteousness. So the first righteousness by faith is found very early, in Genesis 15:6 hundreds of years before the law at Mt. Sinai. Faith precedes the law. Faith justifies without the law! The miracle baby that G-d gave to the too-old-to-bear-a-child couple was now to be used as a challenge to Abram's fidelity to G-d with righteousness previously imputed to Abram via his faith in what G-d promised him even before it happened. Once we receive a miracle, we get possessive of it. G-d gave it to me and it's mine. No, it still belongs to G-d.
G-d declared Abram's faith as righteousness before the sacrifice. Abram had no Mosaic law to reference. Abram did the one thing G-d required of him, believed in what G-d said would happen, and once believed, it was attributed to him as righteousness. Is Abram (Abraham), the father of faith, your father? The Mosaic law is a wonderful thing blessing not only the Jews but all of humankind in so far as humankind receives it and bases societies on it. The law of the L-rd is forever. You won't catch me downgrading the law. However, in Jeremiah 31:27-40, G-d takes issue with the obedience of Israel to the Covenant of Moses, the Mosaic law. Deuteronomy 28 states clearly the blessings and curses of obeying and disobeying the law. But the Jews have broken the covenant. G-d does not really want to punish punish punish. G-d really wants his people to be near his heart and be blessed by him. So He says through Jeremiah that he will give them a Brit Ha Chadeshah, not like the one they broke, and he will write it on their hearts and minds. So I take issue with the declaration that the Jews will continue under the law and the Gentiles will continue under grace, two different covenants, two different ways to be right related to G-d. Jeremiah 31:31-24. I know you are careful not to say G-d's name. I try to comply. However, G-d places his word above his name. (Psalm 138:2) Please stay true to his word. Your life depends on it. Please refresh your browser when examining this page. The server will NOT automatically show you the most recent updated page! On Windows 10 this means clicking on the clockwise cicular arrow at the top left of your browser. For extra credit! Please read Romans 9, 10, and 11. Many Christians misunderstand this so please make sure YOU understand it. The Tanach is the trunk of the olive tree, well cultivated. The branches are those who believe and are nourished by the trunk. Gentiles are wild shoots grafted into the trunk. So many Jews are the branches broken off the olive tree by bad teaching, ignorance or incomplete understanding, trusting others (the rabbis) for their well being, etc. How much quicker and appropriate that you can allow yourself to be grafted back on to the trunk, the original branches still alive! Get back to the tree! Don't just watch the Gentiles enjoy what is supposed to be your heritage! Do you have to become a Christian to become a completed Jew? Absolutely not! There are Messianic Jews and Messianic rabbis more than when I lived in Israel when the newspaper had articles such as "Death to Missionaries!" Find one! Here is a Teddy Bear, gentle in manner, Jonathan Bernis of Jewish Voice Ministries. * This is not to say the Jews killed Jesus. The high priest prophesied it is better for one man to die for the people rather than the people perish for one man. (John 11:50) This was G-d's plan, that Yeshua would die for our sins. It was the high priest's plan to protect the people from the Romans. The high priest said the right thing for the wrong reason. He did not know that what he said was correct. Jesus did die. But that was not the end. It may seem odd to associate John 11 with this song, however, because Jesus humbled himself and allowed his own death, G-d lifted him high up. To go up, you must first go down. I am not calling you Christ killers!